12/05/2018 03/17/2019 - by Mark Hyde - 2 Comments. 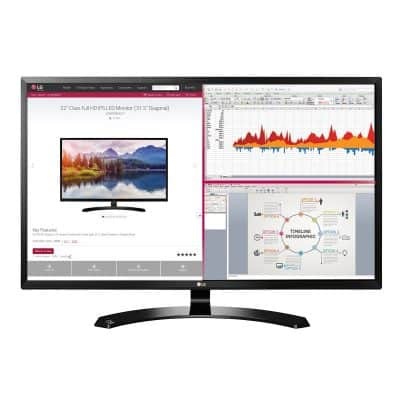 The LG 32MA70HY-P 32-Inch Full HD IPS Monitor is a budget monitor that’s ideal for media consumption and productivity. It sports some impressive on-paper specs including screen splitting capabilities, a 1080p resolution and a larger than life display. When fit with the right kind of user, it offers excellent value for every dollar spent. Read the LG 32MA70HY-P 32-Inch Monitor Review to find out more. The LG 32MA70HY-P monitor has lots to offer at a decent price and looks good too. Among the features that we appreciate most include its large screen along with the split screen feature, and wide viewing angles and good color reproduction (owing to the IPS panel). However, if you are a gamer, the absence of Adaptive-Sync technology features make it prone to ghosting and motion blur more so when playing fast-paced games. Further, the port selection and the wide pixel pitch make it less admirable to professionals who demand color accuracy. However, for general productivity and media use, it suffices quite well and at a good price. From the design, to the specifications and finally the features, the LG 32MA70HY-P is a decent “no frills” monitor. The design is slim and sleek with an all-black finish. It further features a thin bezel surrounding a massive 31.5 Inch display, a curved base plate, and a generally minimalistic yet inspiring look. The LG 32MA70HY-P’s exterior is made of black plastic, with the base being slightly textured. The half-moon crescent base is made of metal overlaid with plastic and is quite sturdy. Once assembled, it measures 28.6 x 19.4 x 8.1 inches and weighs 14.3 lbs. The monitor is held upright by a small stand with a slot for cable management for neat cable management. The setup is pretty easy to fix up right out of the box. However, the downside here is that you will have to contend with limited motion freedom. It only allows for 15 degrees tilt freedom, but lack swivel, rotate motion and height adjustment. However, it would be unfair to criticize LG for this such features are only found at higher price points. Planning on watching movies on this monitor? That should not be a problem with the semi-glare finish that the LG 32MA70HY-P comes in. Glare is to a large degree managed by this coating further affirming its intended use as a productivity and multimedia device. Screen brightness is within acceptable limits, at 250 cd/m2. For indoor use, that is more than adequate. In case you were wondering whether this unit can handle games, you will be pleased to know that it does. What remains is to figure out just how well it does so. For butter smooth gaming, some of the considerations that one needs to make include a fast response time (1ms – 5ms), adaptive sync technology (Free Sync or G-Sync) and a rapid refresh rate (120Hz – 144Hz). The LG 32MA70HY-P has a 5ms response time and 60Hz refresh rate, which is sufficient to handle most moderate demand games. It may, however, suffer from ghosting or motion blur especially when it comes to very fast paced games with rapidly changing frames. Generally, games playing at around 60fps will experience no motion blur. What makes the LG 32MA70HY-P stand out so much is its massive size. Coming from a 22-inch display up to a 32 inch can cause quite a rush. Without a doubt, the extra space will solve a lot of problems for a lot of people. However, just before you take out your credit card, take a moment to consider if really this monitor is what you need. Pixel density is described as the number of pixel per inch or per in a cm in a display (PPI or PPCM). Take for instance a display has 1920 x 1080 pixels and has a diagonal length of 31.5 inches as in our case, it will have a pixel density of 69.93 PPI and a dot pitch of 0.3632mm. Now take one with the same resolution but with a 24-inch display such as the LG Electronics 24MC57HQ-P, we reviewed recently. It will have a 91.79 PPI and a 0.2767mm dot pitch. Notice that the 31.5Inch display has 21.86 fewer pixels per inch compared to the 24 Inch monitor, and similarly a wider dot pitch (distance between dots). Thus, the closer you sit to your monitor, the more noticeable will be the resolution. If you’re planning to wall mount your unit for gaming purposes or office presentations, then you likely will be fine. But if you are a professional with high demands for color accuracy, then a higher resolution display will be a better choice for you. But if your main use comprises of reading, media, and word processing, then you likely will be alright. As a matter of fact, users such as traders in the stock or forex market, or people who need to open multiple documents at a go will find the extra space quite beneficial and will less likely notice the lower pixel density. On-screen performance, the LG 32MA70HY-P had no issues displaying the required Full HD visuals. Most images were crisp and well defined. As it is with IPS screens viewing angles were good with very little color shifting. The 5ms response time also did a fairly remarkable job of handling fast motions while gaming on Call of Duty with minor blurring and the occasional screen tearing. Sill, if you’re a casual gamer, these artifacts should not worry you or matter. One of the most prized features of the LG 32MA70HY-P is the Split Screen features. More often than not, you find yourself working with more than one source of content and have to minimize windows and flip between them as you work. That is where the LG’s split screen feature comes in handy. It allows you to view more than a single source of content by splitting the screen up to four times in different configurations such that you have all the content displayed simultaneously on your screen. Whether you are a photographer, graphic artist, video editor, composer or just the day-to-day multitasker, this tool is bound to bring you efficiency. Other features worth mentioning are the Flicker Safe features, Six-Axis control and the HDCP (High-Bandwidth Digital Content Protection). The flicker safe feature manages screen flicker to a bare minimum to prevent eye strain. The Six Axis Control allows you to adjust the Cyan, Magenta and Yellow colors of the monitor in addition to the Red, Green and Blue colors. The HDCP, on the other hand, prevents copying of digital audio and video content as it travels across connections, say from your computer to your monitor. Bigger is always better, and the LG 32MA70HY-P 32-Inch Full HD IPS Monitor delivers very well on that end. Its large screen makes it a cinch to work with especially for professionals. Forex traders, video engineer, composer or just the classic multitasker working with Microsoft Office documents and multimedia will enjoy using this monitor. That’s especially for its screen splitting capability, good color reproduction and great viewing angles(thanks to the IPS). In my opinion, the biggest caveat for this 32-inch monitor is that it lacks 100% sRGB color gamut which makes it less of an ideal choice for photo and video editors, among others who require accurate color reproduction. As such, we recommend our Editor’s Choice, the BenQ SW2700PT. An objective analysis of the LG 32MA70HY-P 32-Inch Full HD IPS Monitor demands that we conclude that it is a decent monitor for the price it comes at. If you’re looking to watch movies, play some games, work on MS Office or are just a regular multitasker, this should be a great companion for your day-to-day home and office duties. Mark is an Editor and writer with a deep passion for tech. His primary focus is on laptops, desktops, home appliances, and gadgets. He also supports the idea of a worry-free-life through technology. At his free time, you'll find him in the comfort of hearty food, movies or traveling. His most recent obsession is cooking.